Singapore: Asian stocks slipped on Thursday on weakness in the US and European share markets and caution ahead of an Italian debt sale, though year-end window dressing of portfolios by some traders helped trim losses. Spreadbetters expect London’s FTSE to open up 0.04%, Frankfurt’s DAX to open up 0.3%, and Paris’ CAC 40 to open up 0.3%. The euro extended losses against the dollar to near a one-year low, and a 10-year low against the yen, while the sell-off in stocks and a firm US currency helped crude oil snap a six-session rally and kept gold prices near a three-month low. The Nikkei ended 0.3% lower, recouping some of its 1.1% intraday loss. 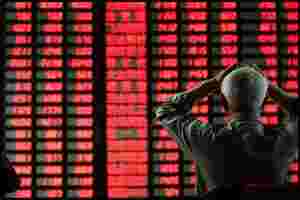 The MSCI ex-Japan Asia Pacific index also shed 0.3%, weighed down by consumer and material stocks. Both indexes look set to be down about 18% during 2011. Traders said Italy’s sale of up to €8.5 billion ($11 billion) of debt later on Thursday will provide further cues for risky assets. The auction is seen as the first test of banks’ willingness to buy longer-term sovereign debt with the nearly €500 billion they borrowed last week from the European Central Bank. While Italy’s short-term funding costs halved at an auction on Wednesday, market players are worried that thin volumes prevalent across markets near the end of the year could complicate its efforts to sell longer-dated bonds. “If it goes well, it’s an indication that, one, yield is coming down, so the cost of funding is falling for the Italian government," said Martin Lakos, division director at Macquarie Private Wealth. “And, two, if there’s demand for the paper, that’s a sign of confidence, which is what the market’s in real need of." The euro weakened in Asia, pressured by stop-loss selling from Japanese retail investors as well as some offloading by exporters, with moves amplified in poor year-end liquidity and traders said the currency is likely to stay vulnerable. The single currency hit $1.2887, moving closer to its 2011 trough of $1.2860 on 10 January. Against the yen, the euro skidded to a 10-year trough around 100.70, before steadying at 100.88. At 11:15 pm, the euro traded at 1.2926 versus the dollar and 100.47 versus the yen. “Nobody sees anything on the horizon that could be mildly positive for the euro," said Rob Ryan, FX strategist for BNP Paribas in Singapore. The one factor that may lend the euro some support is market positioning, which is already tilted heavily toward being short the euro, Ryan said, adding that another is the potential for fund repatriation by European players. Crude oil, which had gained for six sessions on heightened supply worries after Iran threatened to block the Strait of Hormuz, eased as traders viewed the threat as rhetoric. “We also had six consecutive days gaining in the oil market, so it is not strange to see some profit-taking from these sharp gains." Brent eased three cents to $107.53 a barrel by 07:30 am, adding to a loss of nearly $2 the day before. Gold wallowed near a three-month low on Thursday, remaining under pressure due to a firm dollar, while investors fretted over the Italian bond auction.